Hendrix Estate Online Auction — Harritt Group, Inc.
10% Buyer’s Premium added to hammer bid price to determine the final selling price. 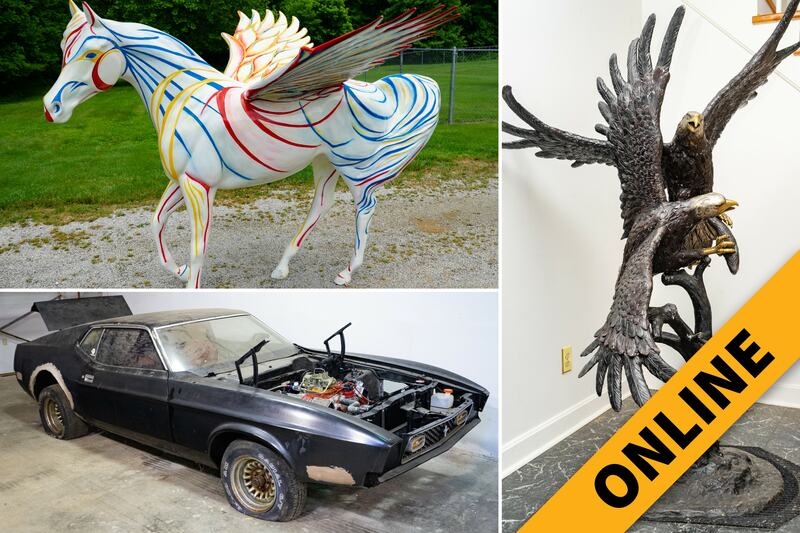 Selling online the eclectic collection of the Patrick Hendrix Estate in Oldham County including a 1971 Lincoln Continental, 1972 Ford Mustang Drag Racer, two Gallopalooza horses, bronze eagle sculptures, Steepleton pool table, furniture, decorative arts and tools. 1971 Lincoln Continental Mark III 2-door hardtop, odometer reading 50,564 miles and a 1972 Ford Mustang Fastback drag racer (work in progress). Life-size Gallopalooza fiberglass horses (known as Louisville’s sidewalk Derby) include “Pensive”, the 1944 Kentucky Derby Winner created by James Gibson originally displayed at the U of L School of Business and “The Spirit of Pegasus” created by Ashley Brossart for commercial realtors CB Richard Ellis/Nicklies. 6’ Cast bronze sculpture of two fighting eagles on cast tree trunk base perfect for a garden or indoor use, 4’ cast bronze bald eagle sculpture by artist Duane Scott titled “Autumn”and a 3’ cast bronze eagle sculpture by artist Edward Chope titled “The Fisherman”. Steepleton pocket billiard table with cabriole legs, 3 in 1 cherry game table with smooth top, poker top, bumper pool top and 4 rolling leather chairs, carved floor cue rack, billiards coat & hat rack, two-piece wrap around cherry bar unit with granite top & brass rails, two-piece cherry mirrored back bar cabinet, (4) swivel black leather bar stools and (2) swivel cream upholstered bar stools. 7’ French style wedding armoire, Louis XV style display cabinet, Victorian style dressing table, baroque style console table, carved mahogany console table, demilune console table, Chippendale style desk, carved Black Forest style bears bench, 4-piece king size cherry poster bedroom suite, cherry highboy dresser, (3) leather sofas, recliners & wingback chairs, glass top dining table & (2) parson chairs, Ernest Hemingway weathervane accent table, lingerie chest, settle hall bench, cherry curio display table, one-drawer stand table and wrought iron coffee table base. Art Nouveau Gustave Gurschner style bronze figural floor lamp, reproduction bronze sculpture of Auguste Rodin’s “Eternal Spring”, Flying Mercury bronze statue, 5’ decorative knight in shining armor, Jean Claude Picot “Sunday Sailing” serigraph, Jean Claude Picot “L’Embarcadere” lithograph, Linnea Pergola “Hudson River Surfing” NYC serigraph, Don Eckelberry “Great Black-Backed Gull” print, Kylemore Abbey Ireland photo print, tugboat table lamp, German waitress statue, figural iron mantle clock, ships in bottles and gold wall mirror. Jazzy 614 HD electric wheelchair. Haier 18 bottle wine cooler, GE mini fridge, Hisense 38” flat screen TV, retro Olympic console stereo, (2) vintage Onkyo speakers, (6) retro stereo speakers, Dimplex mantel electric fireplace, Fibber McGee closet of glassware & collectibles, coffee table books, galvanized sprinkling can & bucket, washboard, NYC cast flag stand, Dietz barn lantern, white wicker storage chest, quartz clocks, VHS movies and vintage board games. Ryobi portable table saw, Precise Fit lawn sweeper, multi-purpose scaffolding, Utilitech industrial floor fan, Central Machinery 8’ grinder/buffer, appliance & hand dollies, mini tiller, shop vacs, circular saws, rotary hammer, antique & woodworking tools, jack stands, welding gloves, c-clamps, industrial rolling carts, Precision Scientific Co. cabinet, electric leaf blower, wood tool chest, retro hand tools, assorted lawn care equipment, assorted yard tools and (3) motorcycle helmets. I-264 to US-42 Brownsboro Road Exit. North 4.4 miles to left on Rose Island Road. 2 miles to left on Spring Drive to right on Belknap Beach Road.